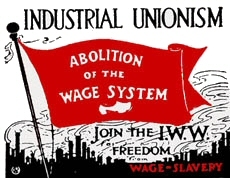 The IWW organizes industrially rather than by trade. These Industrial Unions are to be grouped together into six Departments. Our goal is to organize all industries into One Big Union. For effective working-class solidarity it is necessary that workers be able to plan jointly with either their fellow workers in their own industries, or with their fellow workers to whom they furnish materials. Only with the sort of industrial unionism that adds up to One Big union is this flexibility possible. The lines marking off these industries are not meant as barriers, but rather as specialized universal joints. It is possible for a member of the IWW to be in more than one such union simultaneously. Members may be transferred from one industrial union to another freely at their request by an IWW delegate. Please Note - Even if there isn't a corresponding link for each industrial union, there may still be a functioning Industrial Union Organizing Committee. Please see our list of IWW Branches for more information. Father Haggerty's Wheel - A graphic representation of the IWW's structural industrial union organization program.